I love the bright color of this slightly sweet beet hummus. 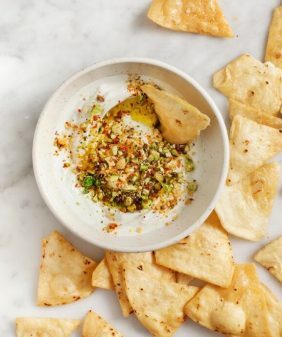 A little cumin & coriander enhance its flavor, making it an addictive appetizer or snack! First things first – THANK YOU for the overwhelming response to Monday’s post about our book! It’s been a secret for way too long, (and therefore a scary post to hit “publish” on! ), but I just loved reading through all of your sweet comments. I hope you love it and that it finds a place in your kitchen for years to come. And now – let’s talk about pink food! I love the way this beet hummus tastes – it’s slightly sweet, but not too beet-y. Jack, our resident beet-hater, was skeptical as I made this, but he ended up loving it. But what really excites me is the color. 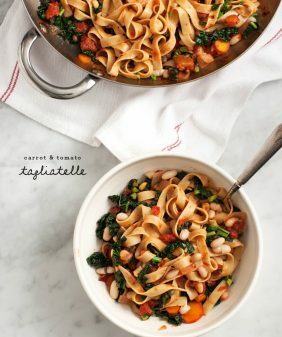 It’s so bright and vibrant – exactly what I feel like eating in the middle of winter when the days are bleak and grey. Ok, that’s an exaggeration because it’s actually super sunny here today. But if it’s grey where you are – try out this beet hummus recipe. I love the bright pink color of this slightly sweet beet hummus! 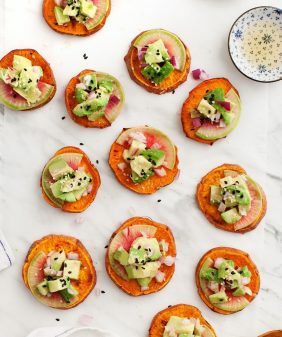 Serve it as an appetizer with crackers or crostini or with veggies as an afternoon snack. Preheat the oven to 400°F. Drizzle the beet with olive oil and then wrap the beet and garlic together in foil. Place on the baking sheet and roast 30 to 40 minutes, or until the beet is fork-tender. When cool enough to handle, peel the beet skins under running water using your hands. Chop the beet and place it in a blender. 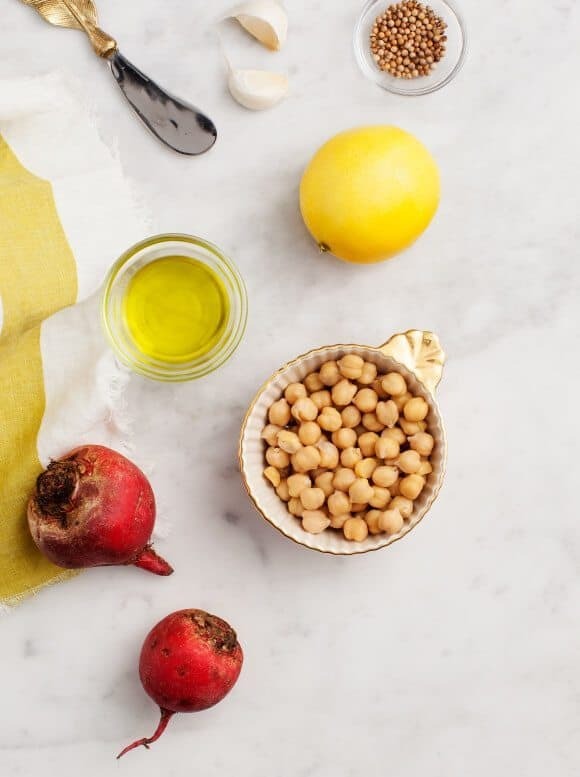 Add the roasted garlic, chickpeas, tahini, olive oil, lemon juice, and water and blend until smooth. Add cumin and coriander, if you like. Chill until ready to use. 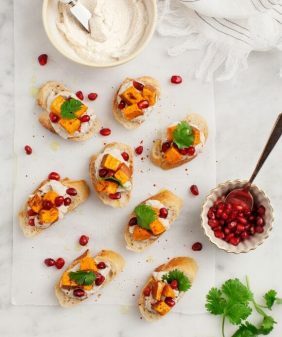 Slather onto baguette and garnish with sesame seeds, pine nuts and parsley (all optional), or serve with crispy raw veggies. Make this gluten-free by using gluten-free crackers instead of baguette. 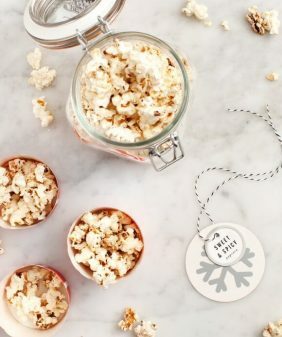 All tabletop products in this post were kindly provided by Anthropologie. This color is gorgeous! Seriously, I wish all of my food was this pretty 🙂 congrats on the book – I am looking forward to it! I also want to says how much I’m looking forward to your book, eventhough I just recently stumbled across your blog! This hummus is gorgeous, and it’s the perfect color for a Valentine’s Day treat! Your photos are spectacular. I can’t wait to try it (I’ve been trying to incorporate more beets into my diet and I LOVE hummus). Thank you for another simple and delicious recipe! So beautiful! 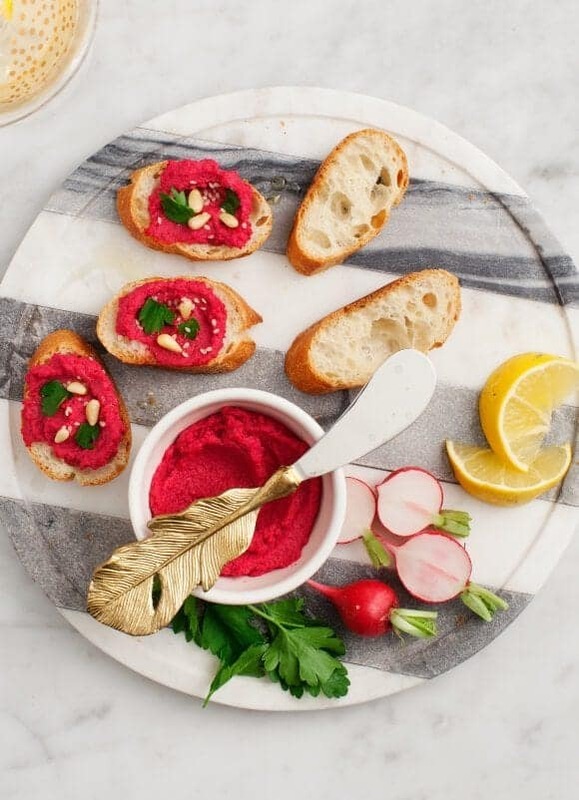 Your photos are stunning and I LOVE the pretty color of this beet hummus. It looks delicious. My daughter will be thrilled to find this in her lunch box to go with her veggies. Thanks for sharing! Hi Diana – I hope she likes it 🙂 Thank you! 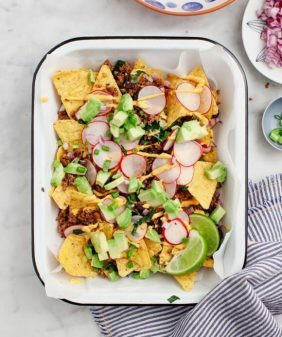 This looks like an easy recipe and healthy, too. The photos are fabulous. What camera do you use? Thanks! This looks delicious! The color is so vibrant and would bring a nice punch of color to any table I’m sure. Congrats on the book as well! Looks like a great recipe!! Cant wait to try it!! Also i must know WHERE did you get that knife???!!? Its gorgeous!! So is your cheese board!!! Hi! Beet Hummus is my all time favourite lunchtime snack. Your version, looks and sounds just as delicious. Am so looking forward to trying. Congratulations Jeanine and Jack! Cannot wait to buy your beautifully illustrated book. This is delicious! I omitted the cumin and coriander as I didn’t like the flavor in another beet hummus I tried! I will be serving this over the holidays!!! Hi Abby, yep, I made that mistake the first time too – definitely need red beets! Thanks – can’t wait to try this out! How long will this humus last in the fridge? I’d say about 4-5 days – I hope you enjoy! AND, the expectation of wonderful flavor does match the richness of the color!